Let me guess, your games more designed for street soccer. Oh and let me just take a shot in the dark at one more thing, your mother has no working lamps in the house anymore thanks to you. Everything you'll need to know about the game and how to enjoy it right here. 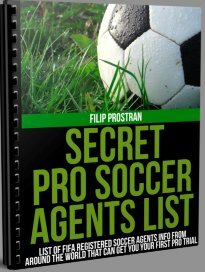 Well if the name didn't give it away enough it's generally a 5v5 (but can be more or less) version of soccer played outside on the road in an alley, street corner or wherever else you can set up a couple of makeshift goals. Two goals, two teams and ball on a street, easy enough to understand? How Can Street Soccer Help My Game for Outdoor? 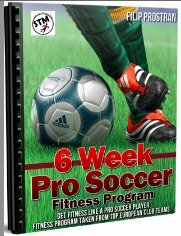 -Because it's a smaller faster paced game it teaches you to give and get it increasing your soccer brain and making you think quicker on your feet, literally. -Due to the restrictions of the size and number of players at one time the game forces you into small spaces and makes you have to problems solve your way out of them. Maneuvering your way out of these situations is an important quality to have no matter what level you play at. -Here's your chance to work on your dribbling. Not megs or rainbows or any other useless tricks but taking players on at speed with a shimmy and shake. -Learning to understand when to dribble not just how to dribble can be just as important. Playing on such a small pitch gives you the opportunity to recognize when it's “on” to dribble and when it's not. Player isolated by himself with just the keeper to beat, go for it. -On the flip side of the statement previous here's a great chance to practice some 1v1 defending. Staying patient, discipline and waiting to tackle in the right moment with your front foot can be reinforced on the street. 7) Can't Hide HERE My Friend!!! -If you're not a deal maker in street soccer then you're a deal breaker. Unlike outdoor if the ball is on the other side of the pitch there is no standing around watching. It keeps you engaged and focused the entire time training your mind to never take a second off. Is Playing Street Soccer Developing Bad Habits for My Overall Game? All of these decisions are within your control and take a conscious decision to change. By focusing on doing the right things all the time can increase your development on the field. Are the Rules the Same as Regular Soccer? Well since you make up the rules I guess you can decide. But the answer is yes, same rules apply. Out of bounds, fouls, generally 5v5 but can be more or less. Just no throw ins from the side, just play the ball in like a free kick. Everything else same rules apply. NOT CLEATS! Anything with rubber soles or even running shoes will do. Of course your regular indoor soccer shoes will do but pretty much anything with a gum sole such as court shoes of any sort along with a decent flexibility to them should do the trick. 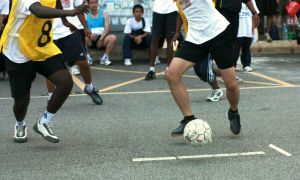 Which Countries is Street Soccer Most Popular? It's played all over the world in every street ally and open parking lot. It's played everywhere in the world and can be played with anything in your bare feet and having goals made of shoes, rocks or whatever else you can find. South America, Europe, North America or Asia it doesn't matter street soccer is played everywhere and it's a beautiful thing. The beauty of it is all you need is a ball. You can make nets from rocks, bags, sticks and whatever else you can find. Have Pro Soccer Players Played Street Soccer Before They Made it Big? Absolutely! Almost every pro you see on TV in the EPL or La Liga and so on have fallen in love with the sport like the rest of us, on the street with some pals. Just because some players go on to play professionally does not mean they don't love the game like everybody else, in fact its quite the opposite. If you don't have good feet look away now this could be painful, I'd love to lie and say street football is for everybody but its not. If you don't have sparks flying out of your boots then you'll get eaten up and walk home with just a story. A sad, sad story. The videos below show Edgar Davids on his World Tour as his Legends face off against the best street teams in the world, have a look. The world’s games in your own backyard, your neighbors are the crowd and you've got nothing but time. No refs, no screaming coaches and no pressure, just you your friends some laughs and the game you love, doesn't get better than that.